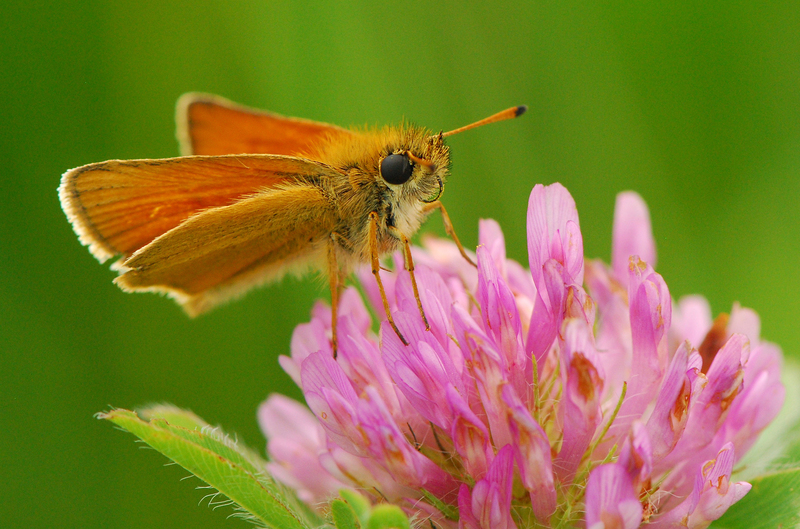 True fact: The European skipper is a recent immigrant to North America, being first introduced near London, Ontario from Europe circa 1910. This species now exists throughout northeastern North America, and is still spreading. Skippers, with their stout bodies, short, dull-coloured wings, and antennal club with a pointed, curved extension (called an apiculus) differ from other butterflies. Some lepidopterists consider them an intermediary between butterflies and moths. True fact: Larvae construct and live in leaf nests by initially making two parallel cuts at the edge of the leaf and folding the cut section over them; when they grow larger the larvae use a whole leaf or may fasten a few leaves together. 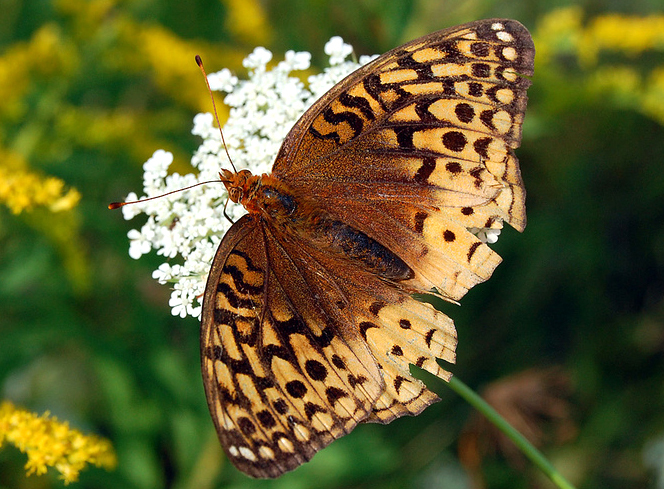 True fact: Most fritillary species are highly similar in appearance. For a fritillary to find a mate of its own species, pheromones and smell play a crucial role in mate recognition. A great spangled fritillary male hovers above a female to waft his pheromones over a potential mate. After mating, females sometimes broadcast their eggs while flying over a meadow, not directly depositing them on violets. Upon hatching, the larva eats its eggshell and immediately begins hibernation. True fact: Question mark caterpillars are rarely seen. They are night feeders, using the cover of darkness to escape the attention of diurnal predators. Adults rarely feed on nectar, instead preferring dung, rotting fruits, fungal infections and tree sap. 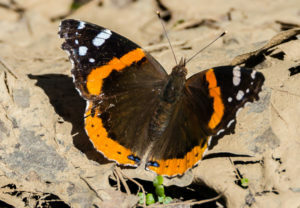 Description: black and dark brown wings, forewings crossed by a red median band, hindwings edged in reddish-orange, underside of forewing with blue, pink and white, underside of hindwings mottled brown. True fact: Red admirals often claim and vigorously defend a territory against other males of their own kind, choosing exposed hilltops and tree trunks as lookout points. In the northern part of its range, in some years this species has been plentiful, while in other years, almost absent. This has led lepidopterists to speculate that this species may be migratory. 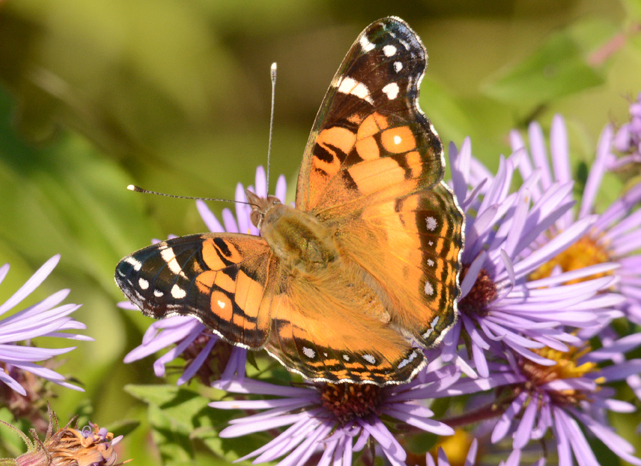 True fact: The painted lady is the most widespread butterfly in the world, being found on every continent except South America and Antarctica. For this, it gets its other common name, the Cosmopolitan. This species is migratory. In some years, huge numbers fly north from overwintering grounds in Mexico and extreme southwestern United States. Charles V. Covell, Jr. A Field Guide to the Moths of Eastern North America. Houghton Mifflin Co. 1984. David L. Wagner. Caterpillars of Eastern North America. Princeton University Press. 2005. Amy Bartlett Wright. Peterson First Guide to Caterpillars. Houghton Mifflin Co. 1993. 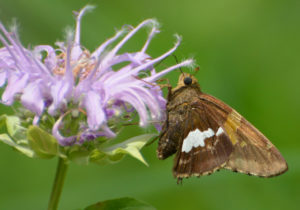 Have recently seen the White Admiral and Giant Swallowtail butterflies in Eastern Ontario. Thanks for posting this! I’ve found it very useful in identifying our local butterflies and moths. We’ve had the following pass through our yard in Singhampton, On this week. Some attracted by the last few wildflowers and others by the sap from our birch tree oozing from sapsucker holes. This is a great site, thank you! I saw a cecropia but had no idea at the time what it was. Beautiful and extremely large. My father said that he saw and captured a butterfly the flow like a hummingbird and had black wings and circle white dots and he is getting old so I want to tell him the species of butterfly he had saw back then. 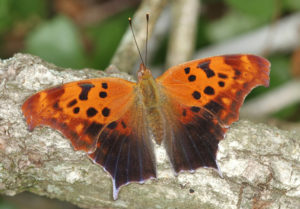 If you look for this kind of butterfly this is maybe it is an extinct species because he said that was the only butterfly that flow and looked like that I have got a picture that I showed to him and he said “That what it looked like.” And I was pretty happy with that just I need to know what it is please help the clock is ticking. It is hard to say without seeing a photo of the species or the butterfly itself, but based on your description I thought the above links would provide the most potentially helpful resources. I found a brown luna moth north of baltimore . lots of woods. Was it is a Polyphemus moth: http://onnaturemagazine.com/butterfly-and-moth-guide.html#polyphemus ? Or did it have tail-like extensions on its wings like the luna moth? PS. If you do have photos to share, we’d love to see them all the same! Your site is very difficult to read. The top title literally takes up half my screen sand does not go away so it’s like I’m scrolling constantly within a tiny little scrollable area to see the pictures of the moths. Except for the ONnatur…. everything is white on pale something, or pale something on white. It’s hard to read! Not a friendly usable design at all. We will take your experience and comments into due consideration. We are in the process of considering feedback to help further update our site. Discovered a beautiful Cecropia Moth enjoying the shade this morning, resting on a window screen……in far eastern Ottawa (?). My mom spotted what looked like a hummingbird working my catmint blooms today. At first glance we wondered if it was a baby hummingbird. Further search and your website brought us to the answer…… a hummingbird clearwing. First time spotting such a thing. What an awesome creature! We found a moth yesterday that looked like a Dragon. It was very dark, had wings that were bat shaped, a long curling talon and what looked like yellow talons”. What on earth is that???? Good info thank you, Was recently in Saskatchewan north near LacLaronge and was out having a smoke at 2am and while sitting in the gazebo my attention was drawn to a HUGE moth or butterfly kinda looked like the luna moth but was a more vivid green colour it seemed to be trying to eat or investigate a cocoon on the wall it was flapping like mad going up and down the wall the few times it settled down it seemed to rest with wings up so i think butterfly but i don’t know for sure what i saw it was BIG BIG BIG Though. Could it have been a species of sphinx moth? Sphinx moths have similar characteristics to those you described. Today I found a black moth with spikes along its abdomen. It had little yellow spots along the wing and a little bit of blue on the underside. Can anyone help me identify this? I have just discovered a clear wing humming bird moth at my parents on stoney lake Ontario close to nephton mines beautiful creatures. First time ever seeing it. In June 2016 I discovered and nearly ate a large moth in my chicken wrap on an Air Canada flight. It was a dusty gray colour and it had a large shiny red dome on the top of its head. What was it? We are sorry to hear about your mid-flight moth mishap. There are quite a few species of gray-coloured moths. As moths get more worn, the scales on top of their thoraxes wear off, sometimes appearing as red or burgundy. Hopefully the flight attendants gave you a new sandwich or awarded you with a bonus item? I as well think hence, perfectly written post! I spotted a hummingbird moth yesterday at my raspberry plants in Latchford Ontario. I was appreciating the butterflies and bees flying about in the yard when I spotted it. At first I thought it was some kind of mutant bee but noticed it’s hummingbird like flight pattern yet it had antennae like an insect. What a remarkable sighting! Thank you for this information along with pictures. I’m going see what other butterflies and moths are around our yard. Hi Kate, so glad our guide was able to help you identify the species you spotted. Wishing you many more happy backyard adventures and discoveries! i have found a 3″ caterpiller? lime green with black & yellow diagonal stripes on sides. approx 3/8″ thick. Thanks so much for helping me ID the ailing Imperial moth we found at Nares Inlet last night..incredible markings. Time to learn my moths! My wife came across a large cecropia sized moth today with reddish rust color main and golden yellow trimmings. It has what appears to be a face detail on its back, very unusual and have never seen one around in southeastern NC before. Can you identify without a photo? We do have images of it. We do not profess to explicitly be moth experts or entomologists, but we are happy to help identify local species. It sounds like your moth was sighted in North Carolina – but if you send a photo to us at info@ontarionature.org, perhaps we can help to identify it. I’ve seen some footage of rusty-colored ceracropia moths before, but am interested to see your photo. Just saw a luna moth on my front porch in Commerce, GA September 2, 2018. I’m greatly enjoying your site. You might want to make a correction to the entry about the Polyphemus moth, though: Homer did not encounter the Cyclops Polyphemus on his odyssey, as you say. Rather, in The Odyssey, Homer writes about an encounter between the Cyclops Polyphemus and his hero, Odysseus. We are you glad that you appreciate our guides and our site. Thank you for this observation!